6th Meeting of Electrific? In Viena! Opening session of the 6th Electrific Project Board Meeting in Vienna. From 28th to 30th, January, 2019, the city of Vienna (Austria) hosted the 6th Project Board Meeting of Electrific. 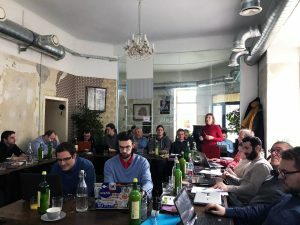 During the three days the project’s partners, Bcnecology, Bayernwerk, e-Sumava, THD, has.to.be, Gfi Informatique, Uni Passau, Uni Mannheim, E-Wald,Energis and CVUT Prague had several discussions on: Electrific APP dashboards; the use of the open-source based MapBox together with the Advanced Driver-Assistance Systems (ADAS); the evolution and deployment of the trials at Transports Metropolitans de Barcelona – TMB, e-Sumava and BAG, and the tools tested, such us the APP and the smart charger for e-cars and the charging scheduler for TMB e-buses. ⟵Also on the 2nd European Conference on Road Transport Research Project Results! Copyright © 2019 Electrific. All rights reserved.